If you don’t vote, you don’t get to complain. No, not that other thing that’s going on. We’re talking about the Golden Joystick Game of the Year. Sixteen have entered, but only one will leave. It’s like if Mad Max had to fight 15 Master Blasters. Ain’t nobody got time for that, but thankfully voting is a simple process that will only take you a few minutes. How do I vote for Game of the Year? You can see the full shortlist for Game of the Year below, and cast your vote here at the Golden Joystick Awards 2016. Tune in on Friday, November 18, to find out who takes home the honors. When From Software released Dark Souls predecessor Demon’s Souls in 2009, the studio put us back in touch with part of our gaming heritage long forgotten. With games getting easier, and tutorials consuming more real estate, director Hidetaka Miyazaki decided it was time to spank gamers like in the old days. You know, when we backtracked seven screens to the inn, and it was uphill both ways. Now, seven years and four games later (including Bloodborne), the Dark Souls franchise is wrapping up, at least for now. This year’s Dark Souls 3 is a refinement of the white-knuckle combat, careful exploration, and the string of profanity vomited from players mouths when they lose a heap of souls. Click to vote for Dark Souls 3 at the Golden Joystick Awards 2016. Adam Jensen returns to air vents around the world in his second global romp. The world has changed since the augmented rampage at the end of Human Revolution. Now, through no fault of their own, those with cybernetic enhancements are feared and reviled by the rest of society. Jensen works to uncover a worldwide conspiracy from the inside. It’s up to you if he does that by dropping bodies or sneaking past them. Click to vote for Deus Ex: Mankind Divided at the Golden Joystick Awards 2016. After Bethesda hit a home-run with its Wolfenstein reboot, shooter fans had high hopes for the long-awaited fourth game in the Doom series. We weren’t disappointed, as Id delivered a blindingly fast, over the top, perfume-soaked love letter to LAN party lovers. The grand vision sinks its hooks in deep, but it’s the little touches that sell this hellbound revival. Snippets of original low-poly levels hidden throughout the game and amusing moments that give the silent Marine a bit of personality show that Id hasn’t lost its bloody magic. Click to vote for Doom at the Golden Joystick Awards 2016. Few studios are able to pull off a massive game release with only five months between announcement and release. Bethesda Game Studios’ Todd Howard took the stage at E3 2015, and his smile as he demonstrated Fallout 4 gameplay for the first time told the entire story. And while the latest entry in the franchise makes innovations, it wisely sticks to the script. There’s a reason that Fallout 3 and Skyrim are go-to games for so many people. Fallout 4 gives players a huge sandbox, memorable characters, and brutal foes. Oh, and this time you can build your own power armor, but have a faithful companion. An immortal dog companion is just as cool as it sounds. Click to vote for Fallout 4 at the Golden Joystick Awards 2016. 343 Industries has finally made the Halo franchise its own with Halo 5: Guardians. The shooter features a great story told from two perspectives, an esports focused Arena mode for classic multiplayer fans, and the new Warzone that offers up bigger battles that get more intense over time thanks to a card-driven upgrade system. Click to vote for Halo 5 at the Golden Joystick Awards 2016. Agent 47 has traveled the globe, finding new and creative ways to “retire” his targets. Sure, you could use a gun, but rigging an ejector seat to rocket your victim into the roof of a hangar is far more satisfying. Bon voyage, rocket man. Click to vote for Hitman at the Golden Joystick Awards 2016. Playdead’s Limbo masterfully used a monochromatic palette to create a foreboding, perilous world. With Inside, the team shows it understands the evocative nature of a relatively powerless protagonist simply trying to survive in a hostile environment. Inside’s presentation isn’t overly complex, letting harsh light, stark shadows, and minimal use of color create a compelling world. There’s a mystery to uncover in the faceless protagonist’s adventure, but we’re not going to spoil that for you. Get on it, though. The internet isn’t going to keep its mouth shut forever. Click to vote for Inside at the Golden Joystick Awards 2016. Procedural generation isn’t rare in gaming these days. What isn’t common is an entire universe of 18 quintillion planets, many of which you’ll never step foot on or even fly past on your journey to the center of No Man’s Sky’s spiraling expanse. Click to vote for No Man’s Sky at the Golden Joystick Awards 2016. The world could always use more heroes! And if you’re playing Blizzard’s Overwatch correctly, to be a hero, you’re helping to move the dang payload. Seriously, we don’t need a Bastion on offense. The fact that you probably know what those things mean even if you’ve never played Overwatch is a testament to how quickly Blizzard’s character shooter has permeated the zeitgeist. In a rapidly crowding sub-genre, Overwatch continues to hold players’ attention. Now, can we please just have that Sombra reveal? Click to vote for Overwatch at the Golden Joystick Awards 2016. While shooter fans have their annual Battlefield vs Call of Duty debate, footy fans know what’s up. Each year, EA and Konami square off on the pitch to find out which soccer game is king. This year’s Pro Evolution Soccer refines the animation system while maintaining a sense of control. A refined career mode and improvements to MyClub round out an impressive package. Click to vote for PES 2017 at the Golden Joystick Awards 2016. Team Valor focuses on strength. Team Mystic values spirituality. Team Instinct likes potatoes. Pokemon Go might not be perfect, but it got us off our butts and walking. The first mobile entry in the long-running franchise doesn’t have a plot, but it keeps us hooked (especially when we’re in a city that has Pokestops every few feet). Click to vote for Pokemon Go at the Golden Joystick Awards 2016. Crystal Dynamics’ Tomb Raider reboot has given Lara Croft new life and a more compelling story. Rise of the Tomb Raider picks up where the 2013 revival’s story ends, as Lara pursues a decades-old mystery last investigated by her deceased father. Of course, if it were as simple as just cracking a book, there wouldn’t be much of a game. Lara travels the globe in search of a lost city and an artifact that can grant immortality. Along the way, she must survive frigid temperatures, heavily armed thugs, and crumbling ruins. Thankfully in the reboot, she’s properly dressed for the adventure. Click to vote for Rise of the Tomb Raider at the Golden Joystick Awards 2016. Jonathan Blow’s long in-development follow up to 2008’s Braid seems simple on the surface, but The Witness is anything but. Hidden behind the numerous maze-like puzzles is a deeper tale that forces players to comb the island environment for clues. With hundreds of puzzles (including an overarching one that leads to the real ending), you’ll have your hands full for a while. If you’re wondering if it’s worth it, uncovering the game’s mystery was so memorable it’s up for Best Gaming Moment this year. 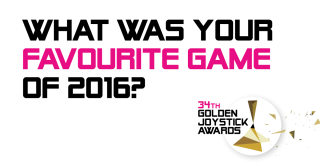 Click to vote for The Witness at the Golden Joystick Awards 2016. Sega and Creative Assembly have done tabletop fans a solid with their first fantasy-based entry in the Total War series. Total War: Warhammer captures much of what makes the miniature game so great, including huge armies, powerful heroes, and sweeping campaigns. And all of that comes at a relatively modest cost compared to the source material. Sorry, Games Workshop. Miniatures are expensive. Click to vote for Total War: Warhammer at the Golden Joystick Awards 2016. Nathan Drake’s tale has come to a close, but it certainly goes out with a bang. Naughty Dog dials up the emotion and tension without sacrificing the momentary laughs that come at Nate’s expense. Uncharted 4 delivers stellar set-piece moments (including a bonkers car chase through Madagascar), stunning vistas, and a story that brings a satisfying end to nearly a decade with Nathan Drake. Naughty Dog is moving on from the franchise (at least for now), but this sweet farewell from the studio is a fitting retirement for one of gaming’s most lovable rogues. Click to vote for Uncharted 4: A Thief’s End at the Golden Joystick Awards 2016. Chances are you’ve failed miserably while playing XCOM: Enemy Unknown. The world was overrun by alien invaders, and you grudgingly started over in hopes of saving the day. Bad news: one of those failed attempts is canon. Good job. XCOM 2 picks up years later, with humanity defeated by a helping hand holding it down. Aliens have been welcomed to Earth, though their benevolence masks a sinister plot to enslave the populace. XCOM’s tattered remains are a last gasp resistance, and it’s your job to galvanize the world through methodical strategy and expert tactics. Don’t screw it up this time, k? Click to vote for XCOM 2 at the Golden Joystick Awards 2016. Be sure to vote in the Golden Joystick Awards 2016 by October 31. Find out which of these great PlayStation games comes away with the coveted award on Friday, November 18.